Google map of the Albania Road Trip: https://goo.gl/0W1nen. ART Google map of recommendations for Albania: https://goo.gl/aAvtMZ. This summer, we finally had an opportunity to go on a road trip to Albania. The country is beautiful, roads have been renovated, beaches in the south of Albania are pristine, people are friendly and welcoming, food is delicious,and the prices are unbeatable. Albania has long been isolated from Europe, and is now emerging as one of the must-see places in Europe. Albania offers a blend of ancient history and new developments, welcoming visitors to discover the history and tradition of Albania, while enjoying the captivating beaches, nature, and newly established cafes, restaurants, and hotels. Nature and beaches: The long Adriatic sea coast, the Albanian Alps in the north, and the mountains between Berati and Permeti are amazing. History and archaeological treasures: Albania is full of history and archaeological delights. In the South, there's the ancient city of Butrint. There are also many other interesting Illyrian, Greek and Roman remains, including UNESCO ancient cities of Gjirokastra and Berati. People, culture, hospitality, and delicious food: Albanians are well know for their hospitality. When you enter their homes, you're greeted with coffee or tea, meze, raki (plum or grape liquor), and warm welcome. Albanian hospitality also shows in most restaurants and cafes, and streets. Albanian cuisine is a rich mix of many civilizations. It has many similarities to Mediterranean, Turkish and Greek dishes, but also has many uniquely Albanian dishes. Albanian lamb from mountains and fishes from Albania's rivers, seas, and lakes are excellent. Fruits and vegetables are grown domestically and always fresh. Activities: Albania is a vibrant country and has something for everyone. From organized water-based and land-based activities to free-spirit explorations, Albania has much to offer and is safe to travel in a group or on your own. Affordability: You get a lot of buying power with foreign currency. At the time of our visit, one USD was worth 125 Lek and one Euro was worth 140 Lek. To give you a sense of buying power, an espresso costs about 50 Lek, a beer is about 100 Lek, a gyro sandwich costs about 200 Lek, domestic fish is about 400 Lek, and most expensive dish is about 1000 Lek. Rooms range from 2,000 to 6,000 Lek. Albania is truly the most affordable travel destination in Europe. We started the road trip in Croatia, drove down to Montenegro (see Montenegro Road Trip), and then through the Albanian coast. We spent almost two weeks in Albania and didn't want our trip to end. Shkodra is Albania's oldest and most historic towns. Today, Shkodra is an important cultural and economic center. Attractions: City center, Rozafa castle, Shkodra Lake. Where to eat: Tradita Gek & Tosk, Bar Restaurant Elita, Restorant Freskia, +Fish Art. Where to stay: Hotel Tradita Geg & Tosk, Hotel Colosseo, Grand Hotel Europa. Tirana is the capital of Albania. It is the center of political, economic, and cultural life of the country. It's a must-visit destination in Albania. Attractions: City center, Skanderbeg Statue, National History Museum, Parku i Madh (Grand Park), Mount Dajti, Kruja Castle, Skanderbeg Museum. Where to eat: Vita99, Etnik Restorant, A La Sante, La Bottega dei Sapori. Where to stay: Monarc Hotel, Dinasty Hotel, +The Rooms Hotel**** Tirana, Hotel Boutique Kotoni. Durres is the second largest city in Albania and home of Albania's main port, Port of Durres. Where to eat: 2 Kittarat, Badriklo, +Restorant Picante, Charli Max Marina, Restorant Piazza. Where to stay: Hotel Oaz, Hotel Adriatik, +Hotel Bleart, Hotel Arvi, Hotel Vila Lule, Aragosta Hotel. As one drives south on Albania's coast, the beaches become more beautiful. Vlore is the perfect example with its beautiful beaches. Vlore is the second largest port city of Albania and its coastline accounts for about 30% of the entire coast of Albania. It's a large city with a busy city center and many beautiful beaches (and hotels) on the outskirts of the town. Attractions: City center, beaches (Radhime and Orikuni), Kanine Castle, Zvernec Monastery, Independence Monument (Albanian Declaration of Independence was proclaimed on November 28, 1912, in Vlore), Independence Museum. Where to eat: Taverna te Lilo, Restorant Platinium, Holiday, Palma. Where to stay: Hotel Liro, Hotel Regina, Hotel Partner, Hotel New York, Hotel Helia, Paradise Beach Hotel, Hotel Pashai. The drive between Vlore and Saranda - Wonderful! The drive between Vlore and Saranda is only 125 kms (78 miles) long but it takes 4 hours to complete. The road offers one of the most scenic and spectacular views along the Adriatic coast. The road follows rocky cliffs and blue waters of the Adriatic, with charming hotels and cafes, and popular beaches along the way. Plan to stop at the wonderful beaches along this road! At the highest point of the road, Llogara pass at 1,043 m (3,422 ft) elevation, there's an amazing view of the Ionian Sea with a steep slope going down again. Hair-raising switchback turns bring drivers closer to the sea once again, passing small villages and quiet beaches. The road is well-paved and four-wheel drive is not required. However, caution while driving is required as there are many changes in elevation, and many steep and curved sections of the road. 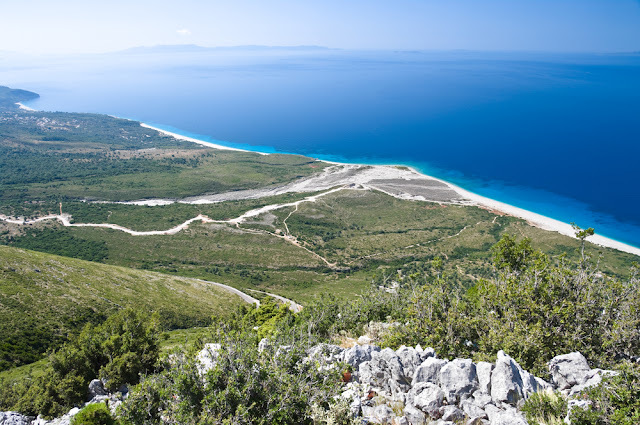 Drive slow and carefully, and enjoy the beautiful views of this unspoiled area of the Albanian Riviera. Saranda is one of the most beautiful tourist attractions of the Albanian Riviera. In 1912, right after the Albanian Declaration of Independence, the settlement had only 110 inhabitants and has grown to over 40,000 at present. Saranda is a popular destination for neighboring Greeks and other visitors of Corfu Island in Greece which is less than an hour away by ferry. Attractions: City center, Beaches (City Beach, Mirror Beach, Pulebardha Beach), Butrint, Ksamil, Blue Eye, Saranda Museum, Corfu Island in Greece. Where to eat: Lekuresi Castle (amazing views! ), Pizzeria Limani, Agimi, Jericho Cocktail Bar, Restaurant Harmony, restaurants in hotels. Where to stay: Hotel Brilant, Hotel Ari, Hotel Royal, Hotel Bahamas, Hotel Aulona, Hotel Kaonia, Hotel Porto Eda. Near Saranda, just 20 km away, lies the beautiful coast of Ksamil and Ksamil Islands. Until recently, Ksamil used to be a quiet getaway from Saranda, with only a few houses and beautiful beaches. Now it has become overpopulated with private hotels, most of which were built illegally. Nevertheless, the beaches are still clean and clear, and a great tourist attraction. The ancient city of Butrint, a UNESCO World Heritage Site, is the most visited archaeological site in Albania. It is only 25 km from Saranda. In Butrint you'll find visible remains spanning two and a half millennium from the first settlers in 5th century BC to Ali Pasha Tepelena. It's a must see! More information is available at http://butrint.al/eng. On the way back to Croatia, via Saranda-Gjirokastra road, we stopped at Blu Eye. The Blue eye is a spectacular water spring and natural phenomenon where clear blue water of the river bubbles from more than 50 m deep pool. This is the cleanest water source I've ever seen in my life. Gjirokaster, the "City of Stone," is an interesting town where old houses that are roofs covered with stones. It's also the birthplace of Enver Hoxha, the ruler of Albania under Communism for 41 years until his death in 1985. It's also the birthplace of Ismail Kadare, a famous Albanian writer. Best attractions of the city were the old houses, Gjirokaster Castel, Bazaar, Zekate House, and Ethnographic Museum. The last stop before heading back to Croatia was the Church of St. Anthony of Padua (Kisha e Shna Ndout) in Lac. The church is located on top of a hill with beautiful views. The church was built in 1557. The church brings together millions of visitor, Catholics and non-Catholics, in a June 13 pilgrimage to celebrate the feast of St. Anthony of Padua. My first visit to Albania was amazing. Now that I've found the way, I'll be back more often. Albania is still an undiscovered gem waiting to surprise visitors with its beauty and character. Visit it while it's still in its tourist infancy and enjoy all it has to offer. I'm sure glad I did.